Sounds great! Congrats on the molt! Can we see some pics of the eye? @MantisGirl13 wow, i'm getting old. My eyes must be deteriorating, because I got in real tight with the DSLR zoom, and now I can see it's indeed damage. From most angles, unaided eye, you see no irregularities in the spherical surface of the eye. Just the black patch. But as soon as I zoomed in, and more clearly in some angles of incidence than others, you can see a dimpling. The eye looks rotten. This guy, active and healthy as he otherwise appears, has a rotten eye. 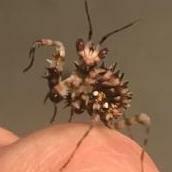 Maybe an injury during molt, maybe damage from a cricket. That would have been over a molt ago. I don't have any crickets nor do I have immediate plans to get any. Put some honey on it asap and it might fix itself next molt. It is indeed damage!